Yesterday, the yield on the 10-year constant maturity Treasury was 2.17% and the yield on the 10-year constant maturity TIPS was 0.01%. So the implied expected rate of inflation for a 10-year time horizon was 2.16%. At the close of trading today, the corresponding rates were 2.08% and 0.09%, implying that expected inflation over the next 10 years fell to 1.99%, one of the largest single day declines in inflation expectations in the available data on 10-year TIPS going back to 2003. Not coincidentally, the S&P 500 fell by 4.6%. What can account for the decline in inflation expectations? In my post earlier today I quoted from today’s lead editorial in the Wall Street Journal. Let me quote the passage in its entirety. Merely by raising the Fed as a subject, Mr. Perry has sent a political signal to the folks at the Eccles Building to tread carefully as they conduct monetary policy in the coming months. This alone is a public service. Mr. Perry and the other GOP candidates should be more careful in their language, and more precise about the Fed’s mistakes. But they shouldn’t shrink from debating the subject of sound money that is so crucial to restoring American prosperity. So the Journal, behind the cover of its admonition to Governor Perry to be more circumspect in his word choice, whole-heartedly endorses his message to the Fed not even to think about using monetary policy to promote economic recovery (“tread carefully as they conduct monetary policy in the coming months”), while encouraging other Republican candidates to join Governor Perry in sending that message to the Fed. Today’s editorial was coupled with the bad news that the CPI rose by half a percent in July, way above the .2% that had been expected, encouraging further scare mongering about inflation, while strengthening the hand of those on the FOMC opposed to any further monetary easing. Is it any wonder that the markets are revising their expectations of future monetary policy in a downward direction — in a sharply downward direction? In the table below, I list 28 instances in which inflation expectations (measured by the TIPS spread on 10-year constant maturity Treasuries) suffered a decline of 11 basis points or more in a single day. Only one such instance took place before 2008, on March 14, 2003; another occurred on March 17, 2008. The remaining 26, have all occurred since the financial panic that occurred after the Lehman Brothers debacle in September 2008. Of those 26 instances, 17 were associated with declines in the S&P 500 greater than 1%. In a paper available here, and discussed here, here, and here, I have shown that until early 2008, the there is no systematic correlation to be found in the data between asset prices (measured by the S&P 500) and inflation expectations. However, since 2008, the daily change in expected inflation (measure by the TIPS spread on 10-year Treasuries) has been highly correlated with the daily change in the S&P 500. To me that is persuasive evidence that in current atypical economic conditions, characterized by unusually pessimistic expectations of future economic activity, raising expected inflation tends to improve expectations of real economic growth, thereby, in and of itself, promoting increased investment, output and employment. One would think that conservatives, who profess to favor unleashing the private sector, would favor a policy calculated to encourage additional private investment and promote increased output by and hiring by American business without any increase in government intrusion into the economy. Isn’t that what the magic of the market is all about? That’s what one would think, but the Wall Street Journal editorial page, in its almost infinite wisdom, seems to think otherwise. 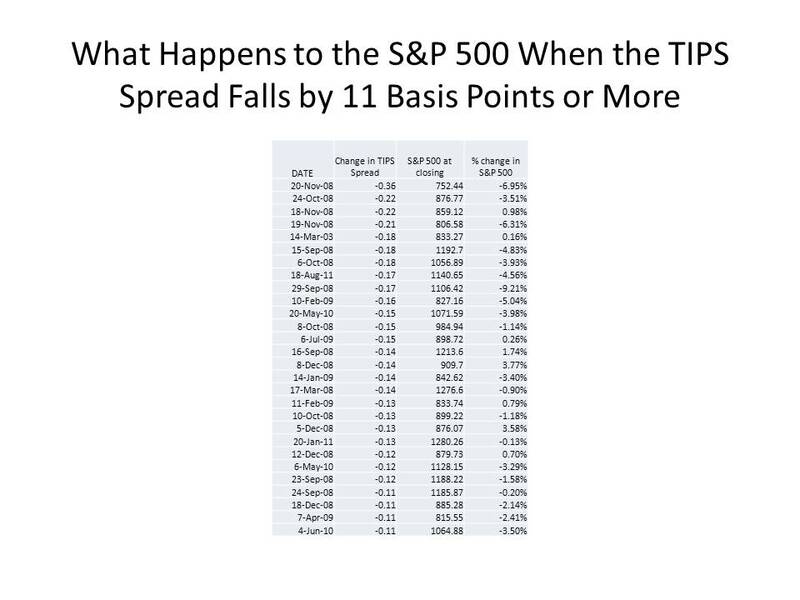 9th down is for 29-Sep-11 for which you predict a change in TIPS Spread of -0.17 and a % change in S&P of -9.21% etc. … just fyi you need to edit that. The stock market is not reacting to the TIPs spread; it is reacting to a banking crisis in Europe. Causality runs from financial fragility to systemic risk to bank runs to falling asset prices and inflation. Why do we have financial fragility? In part because AAA-rated assets at the core of lending collateral are falling in to question. These doubts preceded recession fears; they arose instead from the extreme leverage employed by AAA-rated issuers. Gorton described how this occurred with AAA-rated repo collateral (ABS, CDO’s) in 2007 and 2008; the same dynamic is at work with sovereign bond collateral in 2011. Stability manufactured by central banks leads to a homogeneity of capital structure amongst financial firms and even sovereigns. This homogeneity exposes the system to even the slightest shock (such as the failure of small issuers like Bear Stearns, Greece and Portugal). The dynamic is not unlike a monoculture forest managed with a policy of preventing all small fires; the resulting large fire is more likely to be catastrophic. It was Walter Wriston that famously said, at the eve of the Latin debt crisis, “A country does not go bankrupt.” It was precisely this idea that caused countries to go bankrupt. Freude, Thanks for catching that. I meant September 29, 2008. The change in the TIPS spread and the change in the S&P 500 are not predictions they are the actual observations on that day. David, You are undoubtedly right that financial fragility is a big part of what is going on. But how does financial fragility explain the 17 basis point drop in expected inflation today? I had a story to explain it. Perhaps it holds up, perhaps not. What’s your story? David, a few weeks ago I was arguing inflation expectations had not caved in yet – and gave Bernanke a bit of credit for. It is now, however, obvious that the Fed’s credibility once again has gone out the window. A central bank which claims to want to defend economic and financial stability would not allow for such a gap between money demand and money supply to develop. The drop in inflation expectations reflects that money demand once again is spiking. It seems like you where right a couple of weeks ago and I were wrong. Bernanke is not keeping his promise to Friedman. A valid question. At the moment, the TIPS spread is a tug of war between anticipated Fed easing and the deflationary effects of a run on European banks. The Fed has been keeping up a good fight (in terms of expectations), but by the time a run is taking place, it is practically too late to contain a plunge in inflation expectations. BTW, I need to point out that the situation today is very different from the GD. Then, a collapse in NGDP expectations resulted, years later, in a generalized run on bank deposits. In 2007, the run on shadow bank liabilities began prior to a collapse in NGDP expectations. Similarly, localized runs on European banks began in 2010, well in advance of a collapse in European NGDP expectations. That is why I describe this as purely a lemon problem and not a problem caused by NGDP expectations. David, I have read your paper twice now. It is very provoking, there is a lot in there and I am still mulling it over. In your paper you also mentioned using the USD/Euro exchange rate as a proxy for inflation expectations. The 10 year TIPS spread has collapsed to 2.02 since hitting 2.46 on July 28th. But the USD/Euro rate is pretty much even since July 28th. Any thoughts on this disjunction? Lars, Thanks I am glad to see that we are back in agreement, though i am sorry about the circumstances that brought it about. Your point about the behavior of M2 is very important and thanks for bringing it to my attention. David, I think that we are not that far apart. Here are the key points. The lemon problem is not independent of the NGDP problem, though they are clearly distinct. A more aggressive ECB monetary policy in 2009 and 2010 could have prevented the situation from deteriorating as it has in 2011. Second, once the situation deteriorates as much as it has, a central bank can’t change inflation expectations with winks and nods and traditional central bank-speak. There has to be a dramatic announcement of a change in policy and an explicit price-level, or exchange-rate, or NGDP target announced and a commitment made to achieve the target. Finally, and this is more in the way of a question, is the reason that there is banking crisis in Europe because no one knows which banks are holding how many Greek, Portuguese, Spanish, Irish, and Italian bonds? JP, Good question. I think it is because there are significant deflationary forces emanating from Europe, while in 2008 the deflationary impulse was mainly from the US. Good points all. Where we disagree on NGDP is that a “dramatic announcement”, to change expectations, must commit to higher long run inflation than 2-3%. The relationship between hedging behavior and inflation expectations is non-linear when deflation tail risk exists. Think of your neighbors: at what level of expected inflation would they rush out to buy a house to hedge? I warrant that even 3% (leveraged) is not enough to overcome a potential 100% equity loss. The evidence so far from this housing recovery backs up my view. On the lemon problem, I think sovereign holdings are transparent, but the knock-on effects of losses are not given the extremely low capitalization ratios of banks like Deutsche Bank (which now has low sovereign exposure). David, Why do you need higher long-term inflation? Why wouldn’t a price level target 10 percent above the current price level work? I agree that an announcement has to be non-trivial, but for many reasons I think it would be better to front-load the inflation and then move back toward a suitably defined criterion of price stability. In Volcker’s case, he came in with inflation at roughly 10 percent, so there would have been no point in just going for a small reduction in inflation. I’m not sure if I followed your point on sovereign debt and lemons. Are you saying that everyone knows how much sovereign debt is on the balance sheets of the big banks, but that we can’t tell what a sovereign default would do to the net worth of the banks because we can’t tell how leveraged they are?